Las Vegas is Nevada's neon star and all life in this largely arid state seems to be drawn to it like a bee to the honeypot. People flock here in their millions to experience the grandeur and indulgence of the city, but they're not the only creatures that wind up in this desert oasis. In the same way that developers brought every corner of the globe to this glittering metropolis - New York, Paris, Egypt, Greece and Venice and just some of the countries represented at themed hotels - the city has also brought in animals from around the world. While Las Vegas has no official zoo, wildlife abounds. Hundreds of animals roam our desert, both in their natural habitats and in preserves, and in true Vegas fashion you can get up close and personal with them. Pose with lions and tigers, swim with dolphins, rub noses with a giraffe or breathe in the dust of a wild mustang stampede. So where can you find the city's most famous furries? 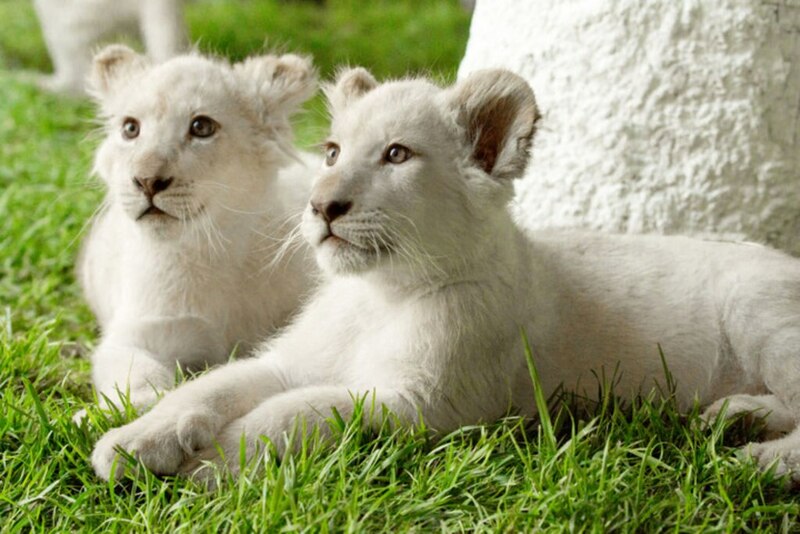 Top billing goes to Siegfried and Roy's white tigers. Part of the Secret Garden at the Mirage Resort and Casino, the tigers are spectacularly beautiful and it's easy to get mesmerised by their piercing eyes. The lush gardens they're housed in make you feel like you're in a foreign land and you can snap pictures as they romp in their waterfall-enhanced habitats. The white-striped tigers and snow-white tigers aren't the only big cats on show - lions and leopards also reside here. Entertainers Siegfried Fischbacher and Roy Horn have worked with tigers in Las Vegas for more than 30 years, training them to perform alongside them in shows, and more importantly, save the rare breeds from extinction. While the duo retired in 2010, many of the animals housed in the Secret Garden were part of their stage show. Just footsteps away, bottlenose dolphins swim, catch fish and bounce on their tails across large tanks of water. 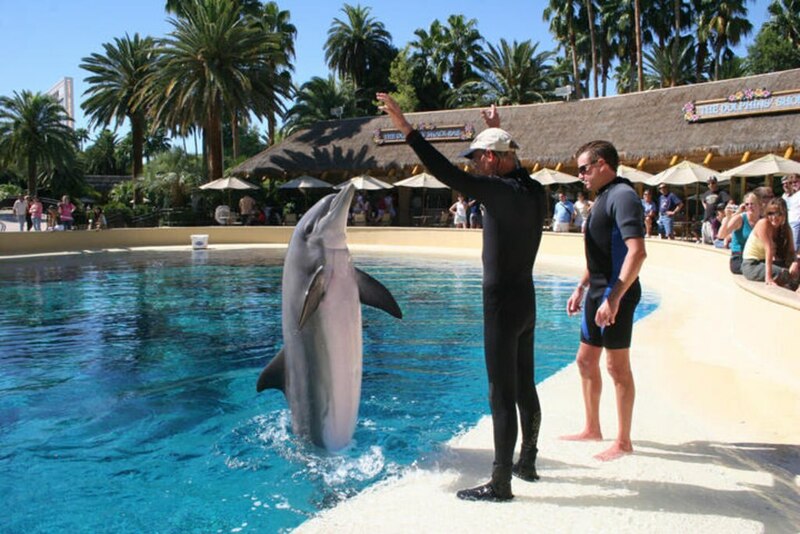 The Dolphin Habitat (also at the Mirage) is a research facility designed to teach the public about these highly intelligent sea animals. While the dolphins don't perform on a regular schedule, they're naturally playful with one another, so visitors have a good chance of seeing them frolicking together. An all-day pass to both attractions costs $19.95 for adults and $14.95 for children (ages 4 and under). The experience is well worth the cost; it's not every day that you get to see lions, tigers and dolphins, much less in the same place. For an additional fee, you can create a unique piece of art with the help of a bottlenose dolphin or play trainer for a day. 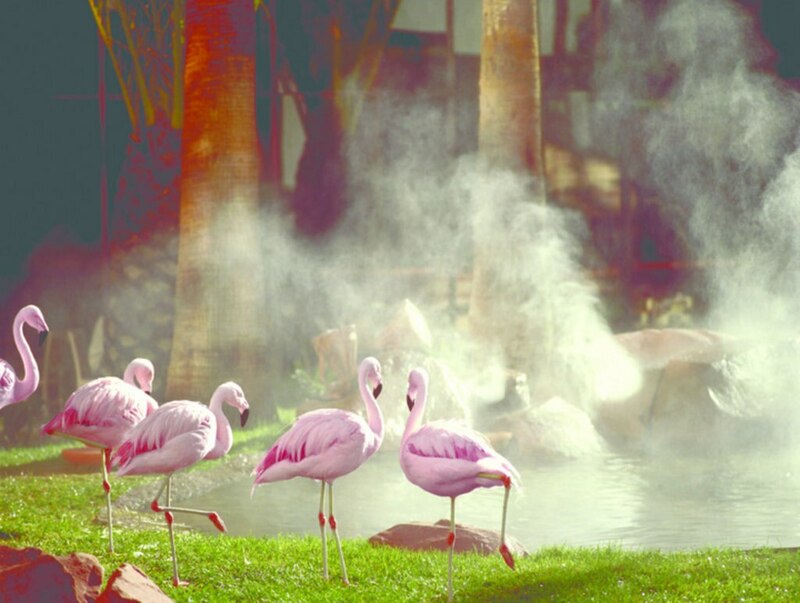 At the Flamingo on Las Vegas Boulevard, the Wildlife Habitat has more than 300 birds - flamingos, pheasants, quail, swans, ducks and parrots - flying free. This sanctuary is a hidden oasis amid the bustle of the Strip and is a favourite stop for me and my family. While strolling along the resort's streams and bridges, there's a good chance you'll cross paths - literally - with a few birds; they frequently fly or waddle right up to guests. In the lakes and streams around the resort, you're also likely to catch sight of koi, turtles and catfish. Best yet, the Wildlife Habitat's grounds are part of the Flamingo's huge outdoor complex and cost nothing to roam. The MGM Grand Hotel and Casino was once famous for having live lions that greeted guests near the casino, but resort officials closed the $9 million enclosure in early 2012. The lions, however, still attract visitors, but now at a ranch a few kilometres away in suburban Henderson. These magnificent big cats actually always resided at the Lion Habitat Ranch and were driven daily to the MGM Grand when the exhibit was open. Ranch owner Keith Evans has more than 50 exotic animals on his property in total, which includes ostriches, emus and Nevada's only giraffe - Ozzie - alongside about 40 lions. Staff are quick to explain how the animals are cared for, and it's clear how much they are valued. Outside of the city, it's possible to see wildlife in its natural habitat. While visitors have to drive a bit farther, it's certainly worth the gas and effort to get a glimpse of Nevada's native animals. In Boulder City, a quaint town just south of Las Vegas, bighorn sheep have a history of coming down from the mountains to graze. Those from the River Mountains herd have been frequenting Hemenway Park for more than 30 years. On hot summer days, as many as 100 animals can crowd the park, looking for shade and grass to eat. As a family activity, I like to pack a picnic and head to the park to watch the sheep wander. Many are brave enough to come close to humans, but it's not a good idea to feed them as their diet consists of plants only and they could bite. 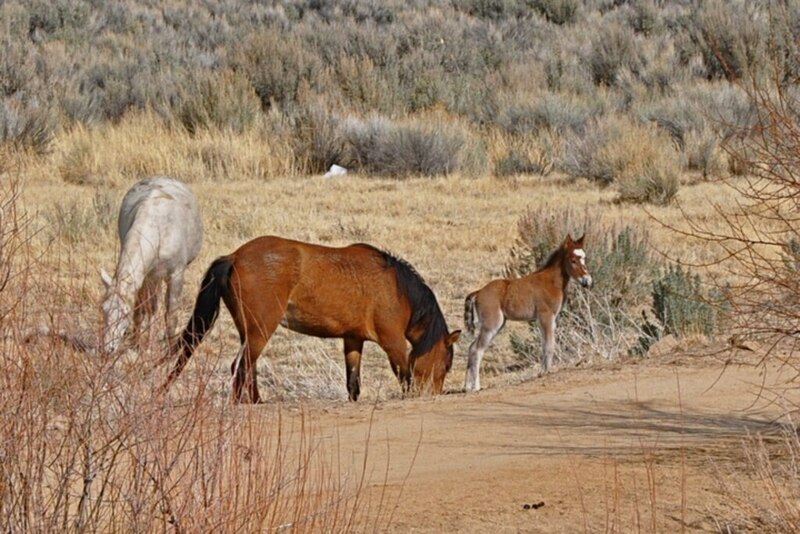 Venture farther out in the wilderness and see Nevada's wild mustangs and burros. An hour's drive northwest of Las Vegas, near Cold Creek, brings you to the desert where the horses often run. Watching them is an amazing experience. They are incredibly beautiful and strong, and they evoke the true spirit of the Wild West. With all the animal attractions on and off the Strip, who needs a zoo? 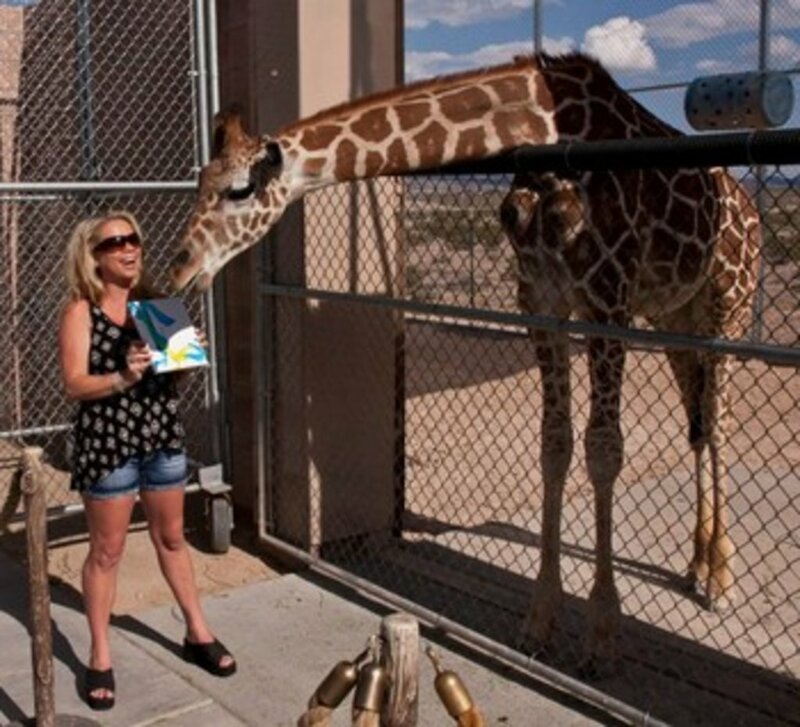 Want to have an animal experience in Nevada? Book one of our Las Vegas hotels and see the city's wildlife. Located on the southern end of the famous Las Vegas Strip, this hotel is close to McCarran International Airport, Crystals at City Center, and the University of Nevada, Las Vegas. The daily resort fee includes 1 Funbook per room, offering $800 in coupon savings. 1 book per room/stay. Funbook provided at check-in. Restrictions may apply. 1 book per room/stay. Offer may not include taxes or gratuities. Valid anytime, subject to availability. Restrictions may apply. Centrally located in the heart of the action, this Las Vegas Strip hotel features a lagoon. The Stratosphere Tower observation deck features 360-degree views of Las Vegas to the Strip. The gateway between vintage Vegas and Strip glitz, the hotel is close to shopping, the monorail and the Convention Center. About 1,000 fountains dance to music and light in front of this European-style hotel set along the Las Vegas Strip, next to CityCenter and a tram ride away from Crystals Retail & Entertainment. At the heart of the Las Vegas Strip, ARIA Resort & Casino offers a luxurious resort experience with technologically advanced accommodations, world-class dining and entertainment, upscale shopping and more. The first casino hotel in Las Vegas, the Flamingo Las Vegas - Hotel & Casino anchors the famous four corners of Las Vegas Boulevard and Flamingo Road and welcomes families as well as high-rolling all-night partiers. Fronted by replicas of the Brooklyn Bridge and the Statue of Liberty, this New York-themed hotel recreates Manhattan's skyline along the Las Vegas Strip; the convention center is 4 miles away. The Mirage is a Las Vegas classic. A 54-foot-high volcano spews fire and steam nightly by the entrance to this Strip resort. Inside, Cirque Du Soleil celebrates the musical legacy of The Beatles through original recordings in their production of LOVE. A tribute to the opulence of Rome, this Las Vegas Strip resort is buffered from crowds by a vast open-air plaza; both the Las Vegas Convention Center and downtown are within 3 miles. Adjacent to the Las Vegas Convention Center, this resort is a 10-minute drive from McCarran International Airport. The on-site stop for the Las Vegas Monorail offers convenient access to the Strip.